Tasmania has long suffered the problem of too many people not getting enough daily activity. This had led to the rise of preventable diseases such as diabetes, heart disease and some cancers. With our growing population and booming tourism numbers, we should be looking at ways to reduce the economic costs of traffic congestion and improve amenity for people who have no choice but to drive because of age, disability or work requirements. A solution to both problems is to encourage more people to ride bikes so they get exercise as part of their daily activities and have a flexible transport option other than a car. Electric bicycles provide even more opportunity to get people out of cars as they are capable of being ridden further and faster and can carry shopping and young children. To increase the number of people riding we need more safe places for people to ride. Cycleways separated from motor vehicles need to be built that will get people to work, study, shops and services. Current state and local government spending on bicycle infrastructure is not nearly enough to build networks of separated cycleways in our urban centres. It is also not enough to implement the Safe Systems approach to road construction, which is to separate bicycles on roads of speeds above 30–40 km/h with high traffic volumes. At the last election, the government promised to spend more than $800 million on new and improved road infrastructure over five years, but only $8 million over four years for roadway bicycle infrastructure. This represents just 1% of the roads infrastructure budget. World-renowned urbanist and city planner, Brent Toderian once said, “The truth about a city’s aspirations isn’t found in its vision, it’s found in its budget.” It’s time the Tasmanian budget reflected the desire to be the healthiest state in the country by 2025 and a Towards Zero road toll. 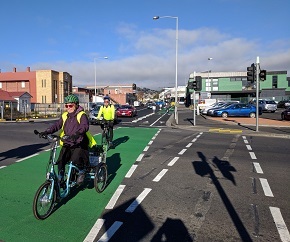 Bicycle Network Tasmania wants to see $9.7 million allocated to bikes in 2019–20 and $39.2 million over the next four years. As part of our budget submission, Bicycle Network is asking the Tasmanian Government for the following key asks. Cycling infrastructure across the state is underfunded. Without a dedicated, ongoing bike infrastructure fund the government cannot take a strategic approach the expansion and early delivery of bicycle networks and cycling projects. We know collective action makes a difference. Together we can future-proof the health and happiness of Tasmania. Share our submission with your local MPs to argue for better bicycle facilities in Tasmania. Become a member today for $10.99 per month and help grow our influence.